Backs American Academy of Pediatrics call to start middle and high schools no earlier than 8:30 a.m. September 2, 2014. Recommends that middle and high schools start no earlier than 8:30 a.m. for the sake of sleep, health, and learning. August 25, 2014. Position Statement: Start Schools After 8:00 a.m. January 9, 2012. Supports later school start times for all Virginia high schools. February 2013. Supports efforts to delay high school start times to 8:00 am or later. August 2013. Middle school and high school should not start before 08:00. A time closer to 09:00 or later would be preferable. February 7, 2016. School start times should be delayed to align with physiological circadian propensity of this age group. June 15, 2015. Association of School Psychologists of Pennsylvania (ASPP. "Current research and practice related to adolescent circadian rhythm patterns and developmental needs indicates that sleep deprivation resulting from excessively early school start times negatively impacts students’ cognitive functioning, physical health, emotional status, behavior/discipline in the classroom, grades and school performance, school attendance and arrival times, and the likelihood of auto accidents. In addition, early research suggests that excessively early school start times have greater negative impacts on economically disadvantaged youth. In view of these research findings, the Pennsylvania Psychological Association supports efforts to educate school administrators and other stakeholders about the risks of adolescent sleep deprivation and to engage in advocacy for moving to later high school start times at the state and local levels." 2015. Recommends that middle and high schools push back start times to 8:30 a.m. or later. August 6, 2015. Supports later start times for high schools students in Okaloosa County, FL. September 20, 2014. Supports movement to change the Cohasset Middle-High School start time to 8:30 a.m. or later. July 9, 2018. Position statement: switching to later school start times does create a more optimal learning environment and improves student achievement for high school athletes. 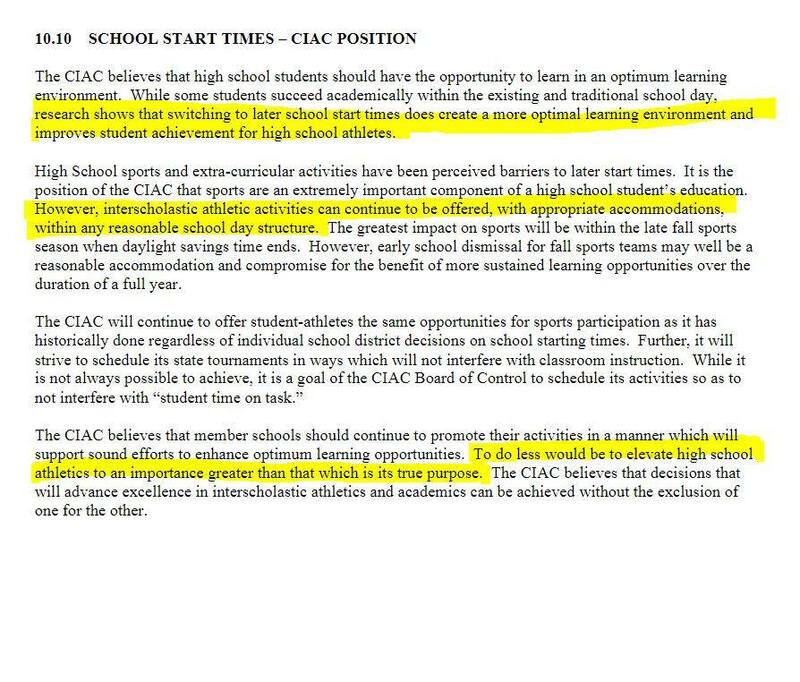 The CIAC will continue to offer student-athletes the same opportunities for sports participation as it has historically done regardless of individual school district decisions on school starting times. (Section 10.10 on page 221) In April 2018 this position statement was weakened considerably to make start times the perogative of local school systems. Supports later school start times for adolescents and endorses the initiative and efforts of Start School Later. Supports the 2014 American Academy of Pediatrics policy statement that middle and high schools should not start the school day before 8:30 a.m. Supports legislation and endorses all public schools (elementary to high school) begin class at 8:00 am or later. 2012. Sleep Health Objective. September 13, 2012. Letter of Support for AAP Recommendation. October 15, 2015. Letter of Support for AAP Recommendation. December 2016. Resolution supports starting middle and high schools after 8:30 a.m. December 5, 2015. Memorandum to School Committee recommending that the start time for middle and high school be moved to no earlier than 8:30 a.m. January 28, 2015. Mental Health and Recovery Board of Portage County (OH) Letter of Support. December 12, 2011. Resolution on reforming school schedules. September 12, 1998. Sleep Deprivation in Adolescents Educational Campaign (Clause 110.03). First adopted in 1993 following submission by the Minnesota Psychiatric Society and retained at every session since then, this first position statement on school start times "urges local school districts to eliminate early starting hours of school for teenagers. Consensus Statement on Early School Start Times. October 2016. Supports delaying school start times for middle school and high school students as proposed in the policy statement on School Start Times for Adolescents by the American Academy of Pediatrics (Adolescent Sleep Working Group, 2014). 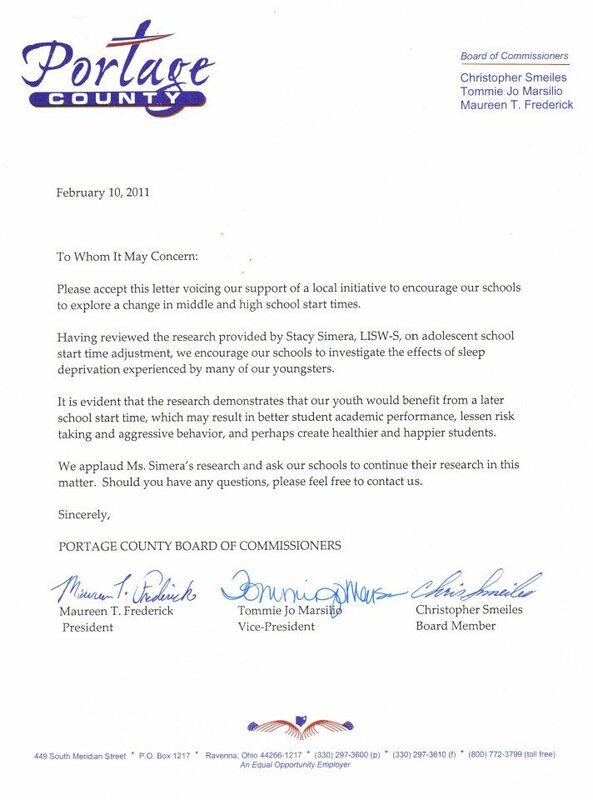 Endorses the evidence-based recommendations that school start times for adolescents occur after 8:30am. August 25, 2014. Backgrounder: Later School Start Times. "Current research and practice related to adolescent circadian rhythm patterns and developmental needs indicates that sleep deprivation resulting from excessively early school start times negatively impacts students’ cognitive functioning, physical health, emotional status, behavior/discipline in the classroom, grades and school performance, school attendance and arrival times, and the likelihood of auto accidents. In addition, early research suggests that excessively early school start times have greater negative impacts on economically disadvantaged youth. In view of these research findings, the Pennsylvania Psychological Association supports efforts to educate school administrators and other stakeholders about the risks of adolescent sleep deprivation and to engage in advocacy for moving to later high school start times at the state and local levels." 2014. Issued a position statement urging middle and high schools to start classes no earlier than 8:30 a.m. November 2017. Supports SB328, a bill that would require middle and high schools to begin their day no earlier than 8:30 a.m. May 2017. Later School Start Times in Adolescence: Time for Change May 2014. Resolution on the goal of the Fairfax County School Board to start high schools after 8 a.m. and to direct the superintendent to identify and report on school divisions with later starting high schools. 2012. Letter of Support. December 1, 2010. Consensus Statement. May 20, 2015. Sleep and Adolescent Health Position Statement. June 1, 2006. Resolved that MASC be authorized to petition the legislature and to support legislation, including S.254, which calls for the establishment of a special commission to study the appropriate starting time for students in middle and high school. June 8, 2015. Joint Statement on Later School Start Times. Resolves to move all high schools in the league to a start time of 8 a.m. or later by 2018-19. March 2016. Resolution C-5 (Adequate Rest) supports school schedules that follow research-based recommendations regarding the sleep patterns of age groups. Resolution encouraging middle and high schools to start class at times that allow for healthy sleep. June 22, 2017. Resolution to recommend that county schools eliminate mandatory classes before 8:00 a.m. Anne Arundel County, MD. September 27, 2012. Letter of Support. January 1, 2011. Resolution urging Seattle public schools to start high schools at 8:30 a.m. or later. February 10, 2014. Resolution on the Impact of School Start Time on Student Health. 2006. Alignment of Sleep Requirement for Optimum Health with School Start Times. May 5, 2012. "Common sense to improve student achievement that too few have implemented: let teens sleep more, start school later." August 19, 2013. Early School Start Times. August 21, 2013. Healthier and Safer School Start Times in Kent. August 19, 2013. Letter of Support. February 10, 2011.